ChemICare targets a cluster of rare diseases currently without therapy: Tubular Aggregate Myopathy (TAM), characterized by painful contractures and progressive skeletal muscle degeneration, York Platelet Syndrome (YPS), where the main hallmark is the abnormal bleeding, and Stormorken Syndrome (STRMK), a combination of the previous two pathologies. 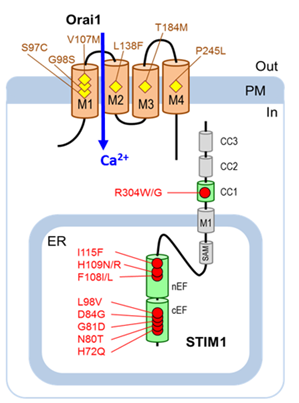 These three diseases are caused by gain-of-function mutations in Orai1 and STIM1, which lead to an abnormal increase in intracellular calcium levels. Tubular Aggregate Myopathy (TAM) is a rare disease belonging to the class of congenital myopathies, characterized by hypotonia and muscular hypotrophy at birth and severe weakening of muscle tone caused by histopathological alterations of the sarcoplasmic reticulum. From a clinical point of view, TAM causes myalgia, cramps, muscle stiffness, with or without weakness. This is a very particular subclass of muscular dystrophy affecting childhood, which is still incurable and has an incidence still unknown (estimated at about 1 new case every 250,000 births). The children affected have a characteristic elongated face and, often, skeletal dysmorphisms. In case of fatal evolution, there is a serious respiratory musculature impairment. York Platelet Syndrome (YPS) has been recently described and represents a rare genetic form of thrombocytopenia. The clinical phenotype is characterized by a greater tendency to bleeding, thrombocytopenia, coagulation defects, and muscle weakness with skeletal muscle atrophy. Almost all the patients so far diagnosed with York syndrome suffer from a greater tendency to bleeding with epistaxis, bruising or post-partum haemorrhage. It affects newborns, causing bleeding diathesis, congenital myopathy and muscle dysplasia. The incidence of this disorder is currently unknown. Stormorken Syndrome (STRMK) is a rare disease discovered in 1985 that affects many districts in the body. The patients affected usually develop thrombocytopenia, resulting in bruising and abnormal bleeding and they also have frequently muscle disorders. Another feature of the Stormorken syndrome is the permanent constriction of the eye pupils (myosis) or even asplenia, ichthyosis (genetic disorder of the skin) and dyslexia associated with migraine. This syndrome is currently incurable and its incidence is unknown.